For ALT’s 25th Annual Conference we will bring together different critical perspectives in Learning Technology from across our community that will examine the challenges ahead and question the shape of things to come. We are putting our values into practice and Members at the heart of the conference, so in this spirit the event will be chaired collaboratively by the Trustees of ALT, led by Sheila MacNeill and Martin Weller. Wildcard: educational technology research, practice or policy work from across sectors. 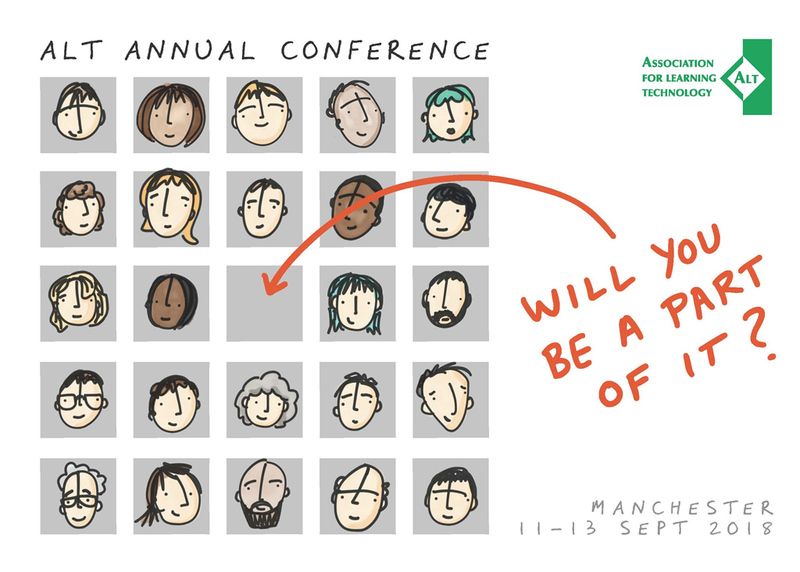 This year we are doing things a bit differently and offering all volunteers to sign up for what they are particularly interested in helping with in the run-up to and during ALT’s Annual Conference. It’s our 25th year and we want the conference to reflect our diverse and growing community across the UK and beyond. The work of the Committee will start in January 2018 as the Call for Proposals is issued and continues up to the conference in September. To express an interest please complete this short form.